The low V.O.C. multi-step catalyzed finish and a ric, Asbury stain will add a sophisticated elegance to the table and to the room you'll place it in. 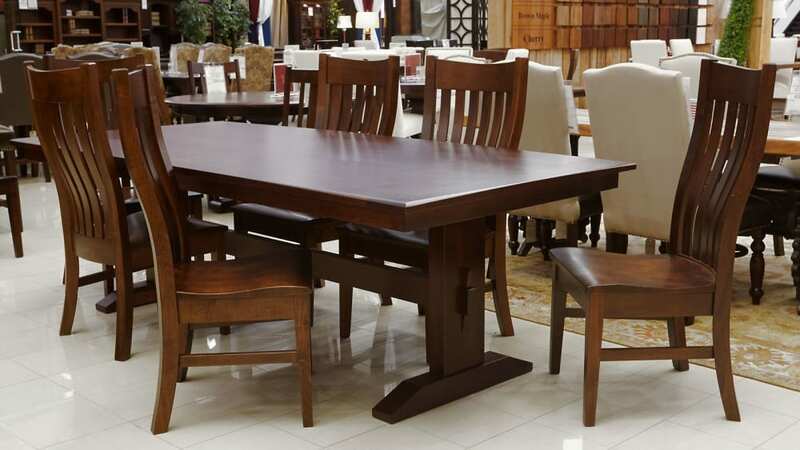 Both table and chairs Alike Are constructed with mortise-and-tenon construction and is glued and screwed to provide a lifetime of protection from wear and tear that your family will place upon it on a daily basis. Made by American Master Craftsmen, using methods handed down from father to son for Generations this collection will become a treasured heirloom within your family. Crafted with sustainably sourced and responsibly harvested cherry and brown maple hardwood from American forests without sacrificing the beauty of our Great American Forestry Heritage.